This unit backs onto a BEAUTIFUL LANDSCAPED STRETCH ideal for any dog owner or family with small children. This quiet CORNER UNIT is the LARGEST UNIT in the complex and waiting for your personal touches. 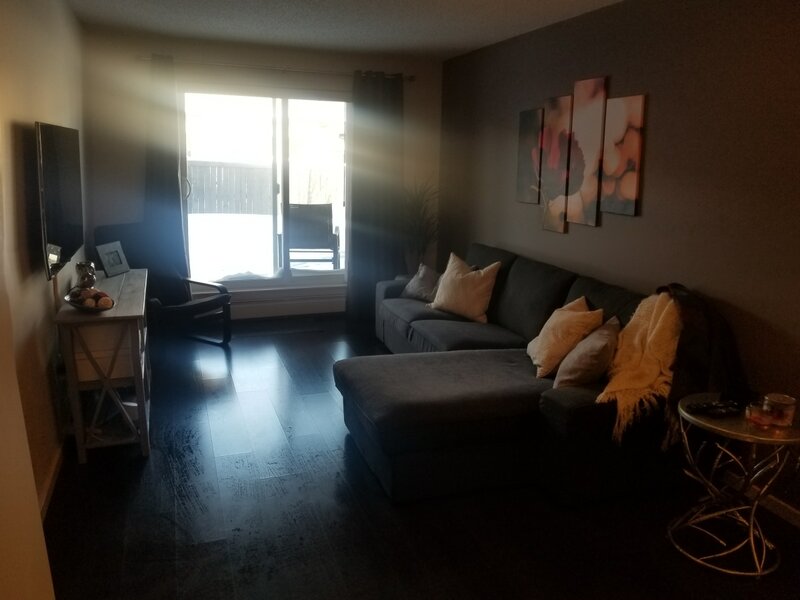 This two bedroom and two full bathroom condo has many UPGRADES including stainless steel appliances, backsplash, blinds, a huge closet and maple charcoal cabinets. Rent includes: in-suite laundry, water, heat, maintenance fees (that’s right – ZERO maintenance), 5 appliances, security system, bike parking and an exclusive use patio. If I couldn’t sell you on the immaculate landscaping, countless windows and massive closet; the neighbourhood surely will – located in the heart of Albany (North West Edmonton), close to a natural wetland, walking trails and the Anthony Henday is where you will find this gem. A three-minute drive will leave you next to Wal-Mart, Sobeys, several banks, LA Fitness and my favorite… Browns Social House! Small dogs/cats okay upon approval from the condo board at an extra $50/month. Underground parking available for $100/month. Above ground parking available for $50/month.